In 1754, Maria Mueses de Quinones, an Indian woman from the village of Potosi, Colombia and her deaf-mute daughter Rosa were caught in a very strong storm. They sought refuge in a canyon between the gigantic Lajas. To Maria's surprise, her mute daughter, Rosa exclaimed with her first words "the mestiza is calling me..." She did not see the figures of a woman and child that the girl described and fearfully ran back with her daughter to Ipiales and told the townspeople. After later returning to the spot, the woman saw an apparition of Our Lady and Child. Some months later, Rosa died and was returned to life when her mother prayed again at the cave. The townspeople came to see this place and encountered the miraculous image burned into the rocks. Our Lady appeared - circa 1750 - miraculously and mysteriously printed on a stone slab, near the bottom of a pit of the Andes, at 2600 meters altitude in Colombian territory now until the beginning of the century belonging to Ecuador, 15 km. the current border. Maria Mueses de Quinones, an Indian woman from the village of Potosi, Colombia and her deaf-mute daughter Rosa were caught in a very strong storm. They sought refuge in a canyon between the gigantic Lajas. To Maria's surprise, her mute daughter, Rosa exclaimed with her first words "the mestiza is calling me..." She did not see the figures of a woman and child that the girl described and fearfully ran back with her daughter to Ipiales and told the townspeople. A few days later, the child Rosa disappeared from her home. After looking everywhere, Maria ran to Las Lajas and found her daughter in front of a noble Lady playing with a Child who had come down from His mother’s arms. Maria fell to her knees believing she had seen the Blessed Virgin and the Divine Infant. Fearful of further scorn, Maria stayed silent about the event but frequently returned to the cave to place wild flowers and candles in the cracks of the rocks. Months later, Rosa fell ill and died. Maria decided to take her daughter’s body to Las Lajas to ask Our Lady to restore her daughter to life. Through the faith of her mother, Rosa regained her life and they returned home to crowds that had gathered to hear what had happened. When everyone went to the cave, they discovered the marvelous picture of Our Lady on the rocks. The Child Jesus is in Our Lady’s arms. On one side of Our Lady is St. Francis; on the other is St. Dominic. The image represents a noble lady from an uncertain period, most probably 16th or 17th century Spain. A mass was celebrated at the cave. The oldest miraculous event was recorded in the accounts of Fray Juan de Santa Gertrudis's journey through the southern region of the New Kingdom of Granada between 1756 and 1764. Without the benefit of sight, Fray Juan traveled through cities, fields and villages blind and on foot from Ecuador to Narino, Colombia begging people for money to build the Las Lajas 19th century chapel. At the completion of the chapel, Fray Juan miraculously regained his vision as a result of his deep faith in the Virgin Mary of Las Lajas. The Roman Catholic Church authorized the cult of Nuestra Señora de Las Lajas Virgin. The Roman Catholic Church declared the sanctuary a minor basilica. A Lady loves manifest beautiful of places where then have erected shrines of great beauty and boldness so steep, but in Las Lajas site chosen over a waterfall 80 meters high is indescribable and photos just give us a faint idea of it. We say mysteriously because the inverse of Guadalupe no eyewitnesses to the image formation, and miraculously because its making has elements that surpass all rationality. The first news of the discovery from two sources that place us in the eighteenth century, around 1750. Place the events in 1754, Bishop and Justin C. Mejía Mejía, who exercised his priestly ministry in Las Lajas for nearly 50 years from 1928 to 1977, told in two books elaborated on this prodigy. Las Lajas, south of Colombia, is located between two populations: Ipiales, Old Spanish Foundation for indoctrination locals, and Potosí, separated by the Indian settlement Guáitara river, only for a long trunk Ilegaba rudimentary bridge when had, more isolated than reported for the same. Mueses Maria Quinones was a potosina, maid in Family Torresano IPIALES and mother of a deaf girl, Rosita. Going to Ipiales the narrow path marked on the banks of the ravine, tangled by the dense equatorial vegetation, sat down to rest in a cave formed by an outcrop of slate, there the girl broke away from the mother beginning to climb the rocks and suddenly began to speak saying, "Mommy, see that it has been mixed with mesticito headlong into the arms and two on the sides mestizos". Stunned, but most happy, Mary bore the child, while it continued: Mommy, mommy, the mestiza is calling me! Ignoring the voices of the girl, again leaving her home Potosí their families, returning to Ipiales to tell what happened to their employers, but they did not believe him. Returning to his home, Rosita had disappeared towards the call of the enigmatic mestiza. 's mother She went to the grotto and was found ecstasy contemplating the image of the Virgin. He took the girl to Ipiales and this time his employers he believed and therefore ... that regardless of the hour, at about 10 pm, were all knocking on the rectory to inform and show Rosita, Father Gabriel Villafuerte, a Dominican, was already asleep, to hear the story and see the child began to ring the bells summoning the neighborhood, attended by the people, and all armed with makeshift torches undertook the risky path, first night pilgrimage reaching about 6 on the morning of September 16, 1754 to the wonderful flagstone. There all caught up, watched a beautiful figure of the Virgin and Child, both crowned, on the right hand of Our Lady a rosary hanging delivery Santo Domingo de Guzman, the founder of the Order of Preachers or Dominicans and the other side Child with head bowed has the cingulate sackcloth for St. Francis of Assisi, who saw both mestizos Rosita. A variant of this story is that India, fearful of provoking of his relatives and neighbors, who did not believe what he had told them preferred to keep quiet about it. Began frequenting the cave, and slowly, filled with wildflowers and tallow candles, her daughter helped her stick on the stone path. Time passed, and the secret it only knew Mary and her daughter Rosa, until the day the girl fell gravely ill and soon died. Mary, heartbroken, decided to take the girl's body at the foot of the lady Guáitara. There Lady reminded all pink flowers and candles used to take him, and asked him back to life. Feeling pressured by the sadness of maternal appeals that did not cease, the Blessed Virgin obtained of her Divine Son the miracle of the resurrection of the little Rosa. Overjoyed, Mary went to Ipiales. He arrived at ten in the evening. He told all his relatives the blast occurred. Those who were already asleep were raised; made to touch the bells of the church, and a large crowd gathered in front of the village church. It was already dawn, and all went into the cave. They arrived at dawn. At six in the morning, were in Las Lajas. I could no longer doubt about the miracle of the cave lights shone extraordinary. There on the stone wall, was forever etched image of the Blessed Virgin. The other source has oldest writing as author, Fray Juan de Santa Gertrudis Serra, a Franciscan, who in 1775 published the 4 tomes Wonders of Nature, one of them relates his adventures in the regions of 1756-1767 including report that in 1759 he was called Don Ramón, Spanish priest evangelist based in Pasto, capital of the diocese at the time. It says that the lady with tailored Concepcion herself appeared in a slab, from which he took his name. Then it is said that an austere and devout penitent before saw a very desolate delicate sketch of the Virgin on a slab on the other side of the river and the place began to be frequented until a priest (Fr Villafuerte have been?) commanded to put a bridge that sticks with increased devotion, pilgrimages and miracles. tions. Moved Brother John wrote a label for the Lady, as do other pilgrims: Pearl rather polished thin shell that is curdled is the Virgin of Las Lajas in the Laja appeared . The previous two versions agree on the miraculous Virgin stamping on a slab of 3.20 m. high by 2.03 m. wide located in a gap of 0.58 m. background. The iconographic set is 1.80 m. by 1.22 m. Our Lady measures 1.39 by 0.76 m., Children 0,40 m. by 0.20 m. including both crowns, the two saints in prayerful attitude, 0.73 m. height each. The Virgin is standing on a crescent moon, on a soft but visible irradiation; scarlet tunic dress covered with dense golden arabesque, like a gimp collar and cuffs; deep blue mantle falling from the back side is collected left under the Child also with golden border, but does not cover the head of long dark hair, the features are very delicate with a slight smile, broad forehead with large black eyes looking from any angle, well-delineated eyebrows, straight nose, small mouth , alabaster neck and hands. The devotion of the faithful donations has resulted in highlighting the real condition of Mother and Son, and from ancient times have received crowns of gold and precious gems whose design respects overlapping originals printed on the slab, were also added necklaces, chokers, bracelets, rings and a belt buckle emeralds, etc., but all this has been stolen, and others sometimes rescued renewed,. sixth and final abduction occurred in December 1988. For the curious observer every cloud has a silver lining, so stripped the Virgin and Child by his pious jewelry has been possible to see the image in its purest form, as it were, without any added naked and verify design crowns and belts as Our Lady should manifest his kingship before both alhajamiento. The mantle currently has a dozen gold stars and silver, have become even fifty and are the only jewelry that were not able to be played on the last robbery. 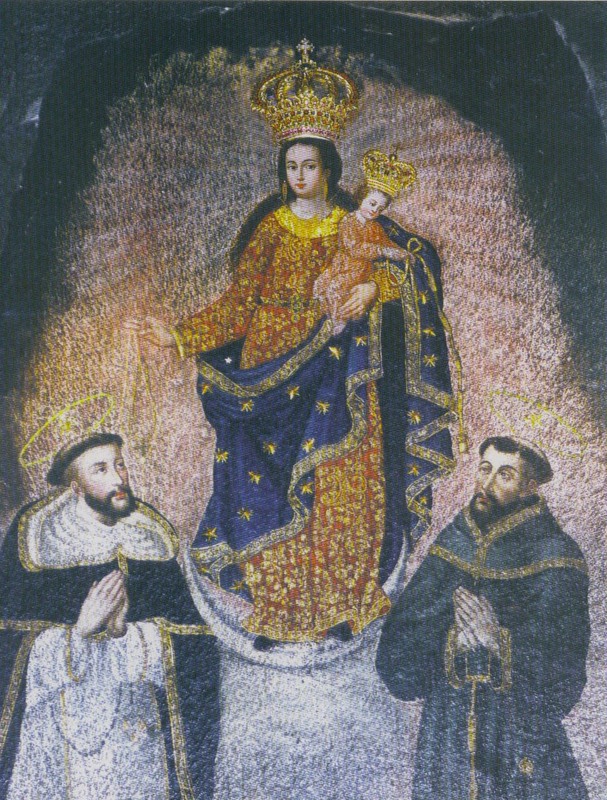 Not all authors admit the miraculous image making, Fr Luis G. Moreno argues that painting is a remarkable similar to those of the Quito school of the sixteenth and seventeenth centuries with the figures of two saints then added oil and assumes that the author could be a painter Marian Dominican friar other images of the Virgin in Quito and other villages in the area are known, it would be the Pedro P. Bedon (1555-1621), provincial of the Order from 1618 to 1621, walker and traveler through those lands. The strong P. Moreno based his argument on two of the pictures painted by P. Bedon have the same saints as companions at the foot of the Virgin and Child and embroidery on the robe of Virgin lajeña can distinguish uppercase P and B. You can not argue on alleged unexplained preservation of more than 150 years the image to Remember in 1754.
! However the general belief is that students will image is not of the man-made, for its colorful event, which is completely matte brightness oil offers some resemblance to the one with the Virgin of Guadalupe, as the airborne dust does not settle on it, or damaging insects ejections, or the handling of the faithful devotee, or e! high percentage of humidity of the place (has Waterfall Front broken within 100 m.), nor has ever been husked, nor has obscured the smoke from the candles, except at the edge of the slab where there is no image , otherwise the color is not superficial, but penetrates the depths of the stone when it has been chipped with a pick. Also, unlike the Guadalupe, who accepted tweaks, it does not support any type of paint, adhesive rejects everything except the blessed wax candles which have now joined the jewels stolen and still preserved stars, nor to pluck, wax the piece shows a painting of the picture, so Bishop Mejía Mejía and argues that one can ignore its mysterious author, "but the P. Bedon is far from it." Fr Manuel Guerrero Chamorro, chaplain of the sanctuary in 1997, go between the P and B, one and tiny, so he understands the three letters mean Pax et Bonum, a figure that summarizes all evangelization. The first temple, if you could call it a modest chapel was erected by P. Villafuerte and housed the first worship until 1794. Today it can be seen opposite the sanctuary a reproduction of the same deck of relics and votive promesantes grateful. Between 1796 and 1853 a second and a third temple is built , all of which were insufficient to accommodate the thousands of pilgrims who came to it. In 1895 the diocesan bishop saw the need to build more temples and unite both sides of the deep ravine; your idea, great, just was crystallized from 1916 when it rose to 30 meters above the abyss the two arches of the bridge over the River bridge that would serve as a plaza and atrium of the neo-gothic Basilica in gray and white stone greatly expanding the space for pilgrims and including in the crypt a new church dedicated to the Sacred Heart of Jesus, the whole laborious and lengthy construction blessed terminated 1949, Pope Pius XII giving canonical coronation of the Virgin in 1952 and the title of the sanctuary a minor basilica in 1954. Note that all shrines erected respected the place of occurrence, ie that each building has never had or background or apse, since construction started directly from the stone, the Virgin with his imposing presence. Domestic and pastoral care of the sanctuary have two Franciscan religious communities, a Colombian and Ecuadorian other, since Our Lady of Las Lajas is a pledge of peace and unity between the two peoples. The image represents a noble and majestic Lady from an uncertain period, most probably 16th or 17th century Spain. The burgundy of her dress is a warm, rich red embroidered with a golden flower pattern. Her long dark hair flows freely. The two large metal crowns were later added by the faithful. The Madonna holds a rosary in her right hand that she presents to St. Dominic who is kneeling at her right. Jesus gives a cord to St Francis who kneels on the left of Our Lady. Rays of light encircle the Mother and Child, whose face is very amiable and is turned toward the observer. In 1951 the Roman Catholic Church authorized the cult of the Nuestra Señora de Las Lajas Virgin, and it declared the sanctuary a minor basilica in 1954. With these clear signs of Vatican approval, the vision is one of several after the era of investigation of apparition claims (that is, after the investigations of Our Lady of Guadalupe apparitions in 1531) that have received the Church's traditional approval without having been formally investigated.